What if, across the river from a small community outside of Portland lay an Impassable Wilderness? And what if, a 12-year-old girl, Prue, and her friend, Curtis, were able to get past into the Impassable Wilderness because that’s the direction they saw the crow’s fly with Prue’s baby brother? 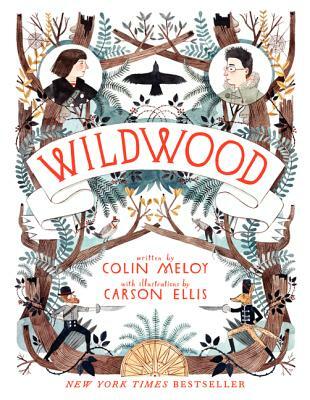 And what if, when they got into the Impassable Wilderness they discovered an entire community: one with talking animals, and Dowager Governesses and a civil war looming? And what if, they got caught in the middle of it? On paper, this book has everything it needs to be a grand middle-grade fantasy. Talking animals both good an evil? Check. Bandits in the forest? Check. An evil queen/governess who vaguely reminded me of the White Witch in Narnia? Check. Golden eagles big enough to carry a person? Check. A baby kidnapping, and a subsequent sacrifice for evil gain? Check. A winning hero and heroine who manage to Figure Things Out (and on the other hand, Completely Dopey Parents who are Utterly Clueless)? Check. So, why didn’t I like this one more than I did? That said, it definitely works as a “mood” book. I did feel like I was in Portland in the fall: it’s a rainy and dire world that the children have found their way into. The pen-and-ink illustrations reminded me of the ones Jon Klassen did for the Incorrigible Children of Ashton Place series, and they were scattered throughout the book providing a needed break from the endless prose. I guess what I’m really saying is that I think this is one of those books that adults think kids should like. And maybe some will. But, as an adult, I sure didn’t like it all that much. I think you nailed it with “I think this is one of those books that adults think kids should like;” especially if the adults have any sentimentality toward Lewis or Tolkien and the like. It was long, Meloy did go on and it was hard to sustain any interest in the rescue let alone why the baby was even kidnapped. The kidnapping/rescue was a device, an excuse for discovery, but I didn't want to be aware of that the whole time… I found it easiest to take it in parts, which is weird to suggest to anyone to set the book down at regular intervals. Or take a breather with those illustrations as you recommend. I love the Decemberists, and the book looks beautiful. I live near Portland, and I loved the first couple chapters. I was the perfect audience for the book (except being an adult). However, it was over long and lost all momentum. It was too impressed with itself. I left the book halfway through wondering 'who is this book written for?' I'd never recommend it to a child and I abandoned it because I kept forcing myself to read it.